4 different wheel options are available. Wheel diameters from 200mm to 260mm. Load ranges from 70kg up to 270kg per castor. Pressed steel fixed castor with a top plate fixing fitted with a black puncture proof steel disc centred wheel with a roller bearing.Wheel diameter 200mm, tread width 50mm, overall height 236mm, top plate 135mm x 110mm, hole centres 105mm x 80/75mm. Load capacity 70kg. Pressed steel fixed castor with a top plate fixing fitted with a black pneumatic tyred steel centred wheel (2 ply) with a roller bearing.Wheel diameter 200mm, tread width 50mm, overall height 236mm, top plate 135mm x 110mm, hole centres 105mm x 80mm. Load capacity 75kg. 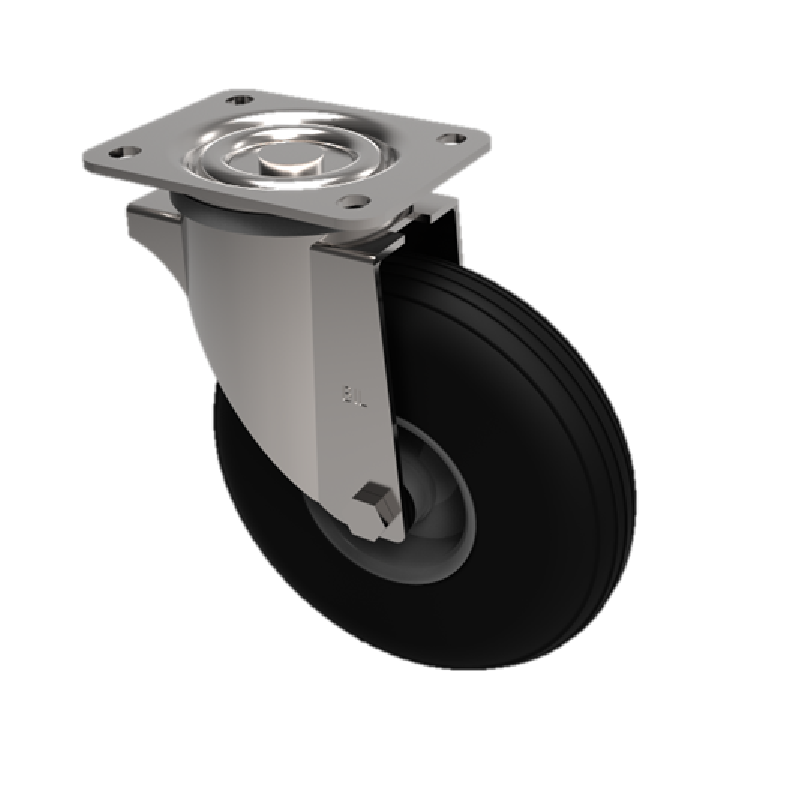 Pressed steel swivel castor with a top plate fixing fitted with a black pneumatic tyred steel centred wheel (2 ply) with a roller bearing.Wheel diameter 200mm, tread width 50mm, overall height 236mm, top plate 135mm x 110mm, hole centres 105mm x 80mm. Load capacity 75kg. 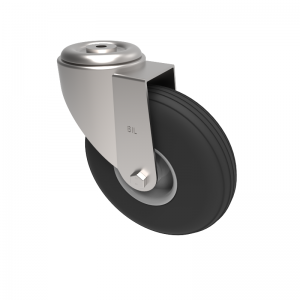 Pressed steel swivel castor with a top plate fixing fitted with a black puncture proof steel disc centred wheel with a roller bearing.Wheel diameter 200mm, tread width 50mm, overall height 236mm, top plate 135mm x 110mm, hole centres 105mm x 80/75mm. Load capacity 70kg. 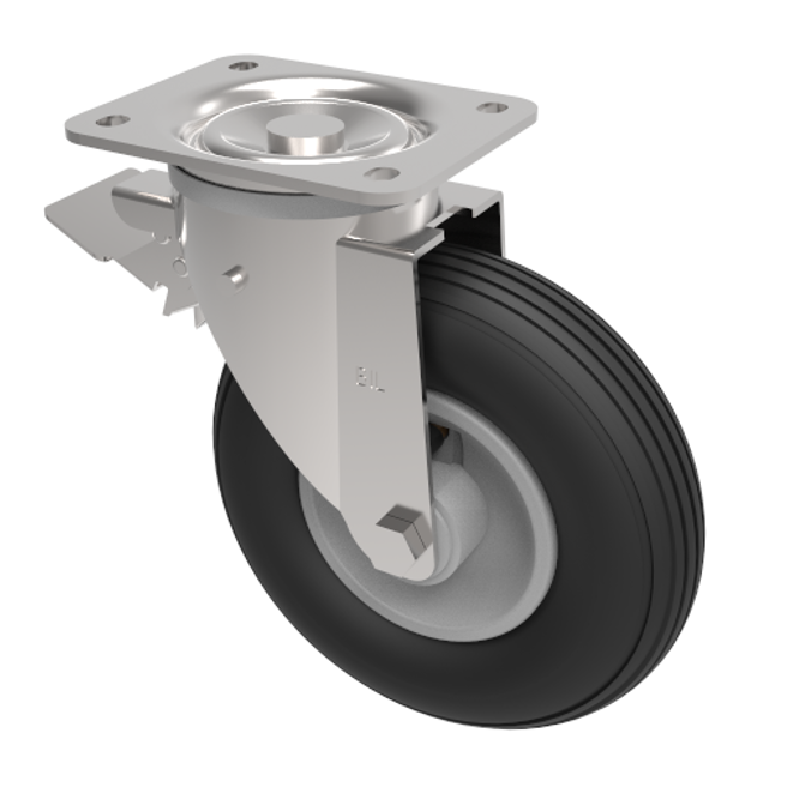 Pressed steel swivel castor with a top plate fixing fitted with a black pneumatic tyred steel centred wheel (2 ply) with a roller bearing and total lock brake.Wheel diameter 200mm, tread width 50mm, overall height 236mm, top plate 135mm x 110mm, hole centres 105mm x 80mm. 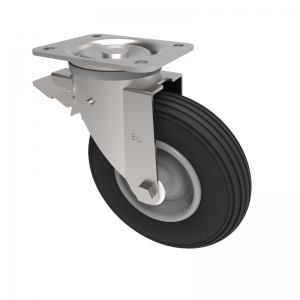 Load capacity 75kg.NB this brake has a leading brake pedal so the brake is away from you when pushing the trolley. Pressed steel fixed castor with a top plate fixing fitted with a black puncture proof steel disc centred wheel with a roller bearing and a total lock brake.Wheel diameter 200mm, tread width 50mm, overall height 236mm, top plate 135mm x 110mm, hole centres 105mm x 80/75mm. Load capacity 70kg. Pressed steel swivel castor with a 12mm bolt hole fixing fitted with a black puncture proof steel disc centred wheel with a roller bearing. 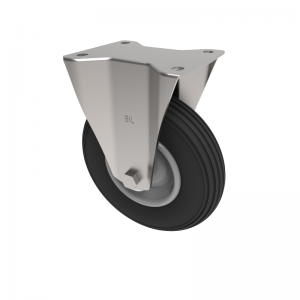 Wheel diameter 200mm, tread width 50mm, overall height 235mm, Load capacity 70kg. Fabricated swivel castor with a top plate fixing fitted with a 4 ply black diamond pattern pneumatic tyre with a red steel centre and roller bearing. 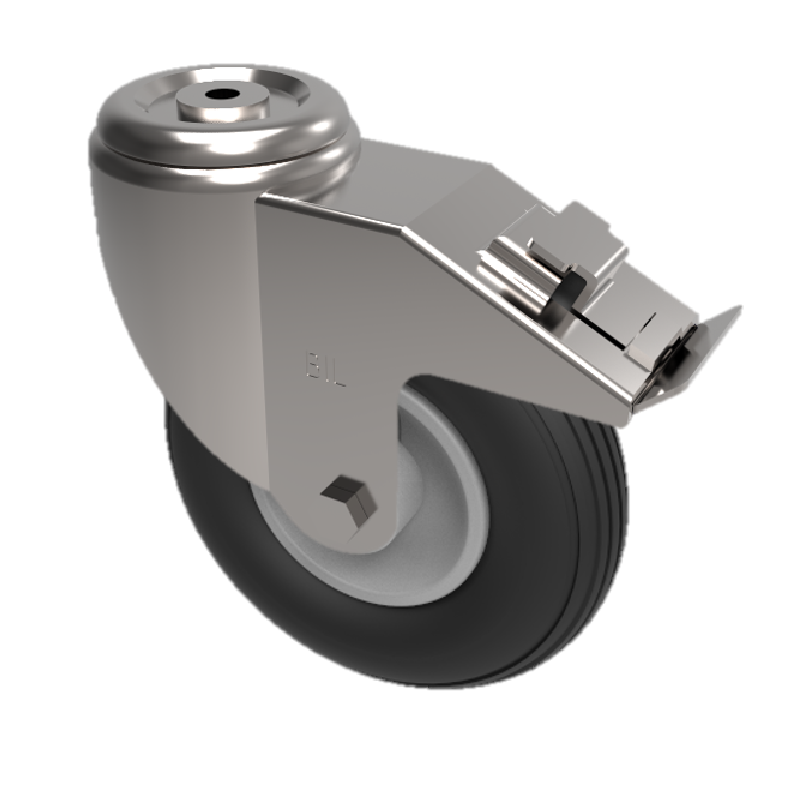 Wheel diameter 260, tread width 85mm, overall height 318mm, plate size 115mm x 105mm, hole centres 92mm x 67 or 76mm x 76mm. Load capacity 200kg. 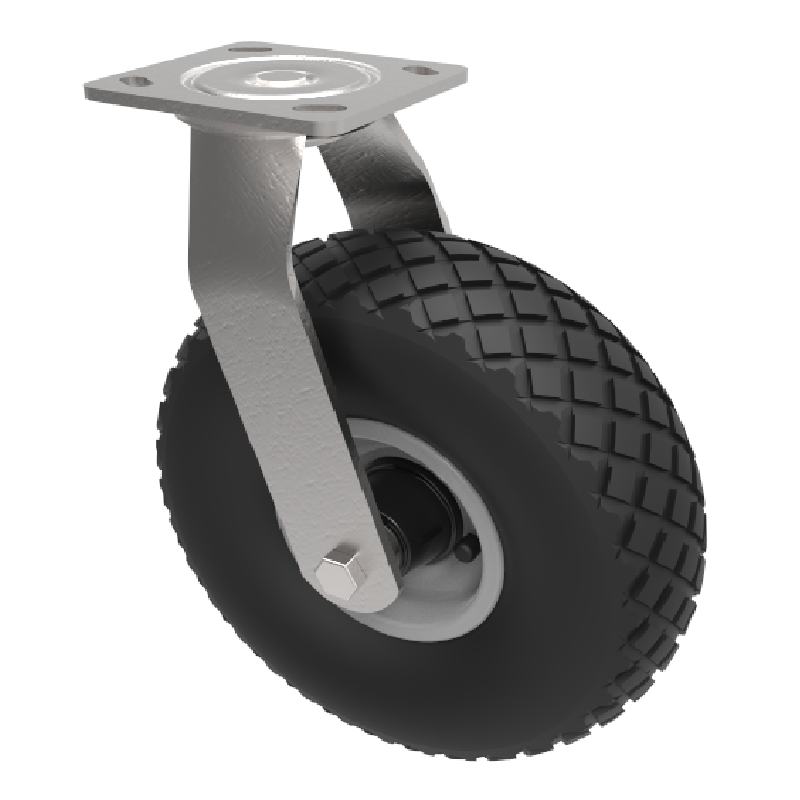 Pressed steel swivel castor with a 12mm bolt hole fitted with a black pneumatic tyred steel centred wheel (2 ply) with a roller bearing.Wheel diameter 200mm, tread width 50mm, overall height 235mm. Load capacity 75kg. Fabricated swivel castor with a top plate fixing fitted with a black pneumatic tyred wheel with a steel centre and roller bearing. 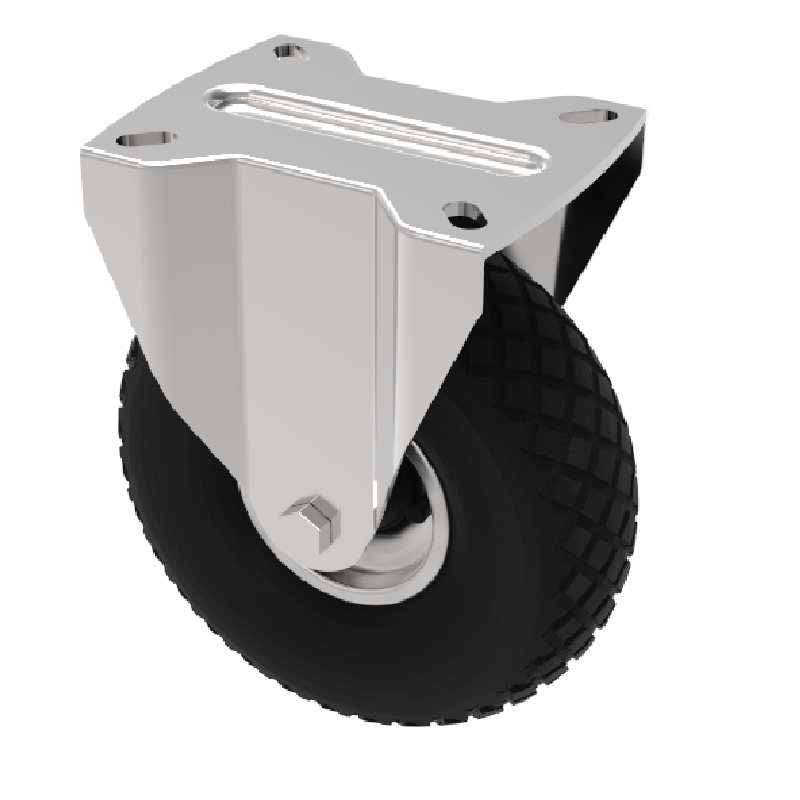 Wheel diameter 215, tread width 56mm, overall height 255mm, plate size 117mm x 104mm, hole centres 81.4mm x 71.4mm. Load capacity 136kg. 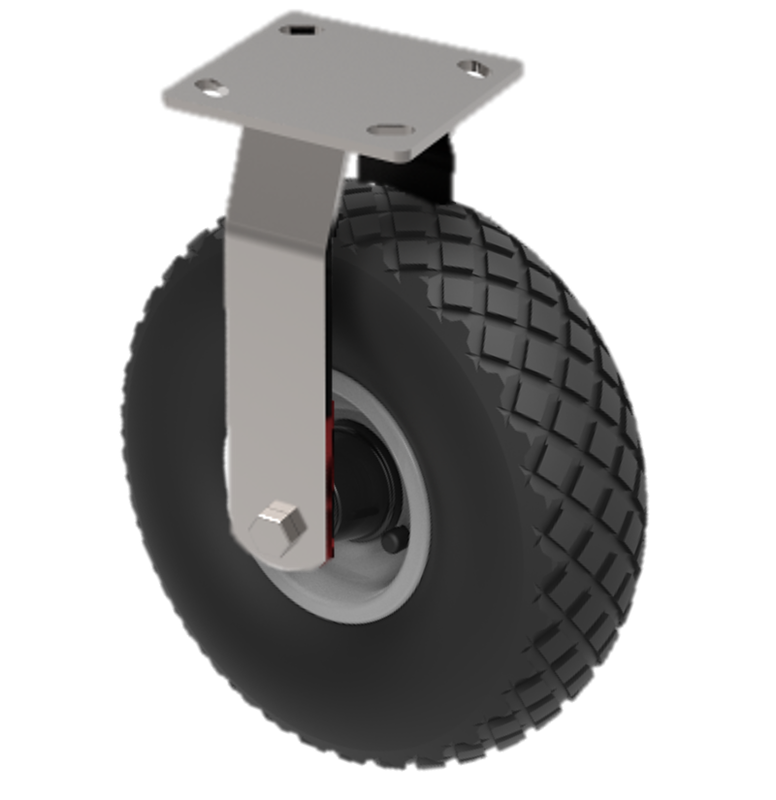 Pressed steel swivel castor with a bolt hole fixing fitted with a black puncture proof steel disc centred wheel with a roller bearing with a total lock brake.Wheel diameter 200mm, tread width 50mm, overall height 236mm, bolt hole 12mm. Load capacity 70kg. Fabricated fixed castor with a top plate fixing fitted with a 4 ply black diamond pattern pneumatic tyre with a grey steel centre and roller bearing. Wheel diameter 260, tread width 85mm, overall height 318mm, plate size 115mm x 105mm, hole centres 92mm x 67 or 76mm x 76mm. Load capacity 200kg. 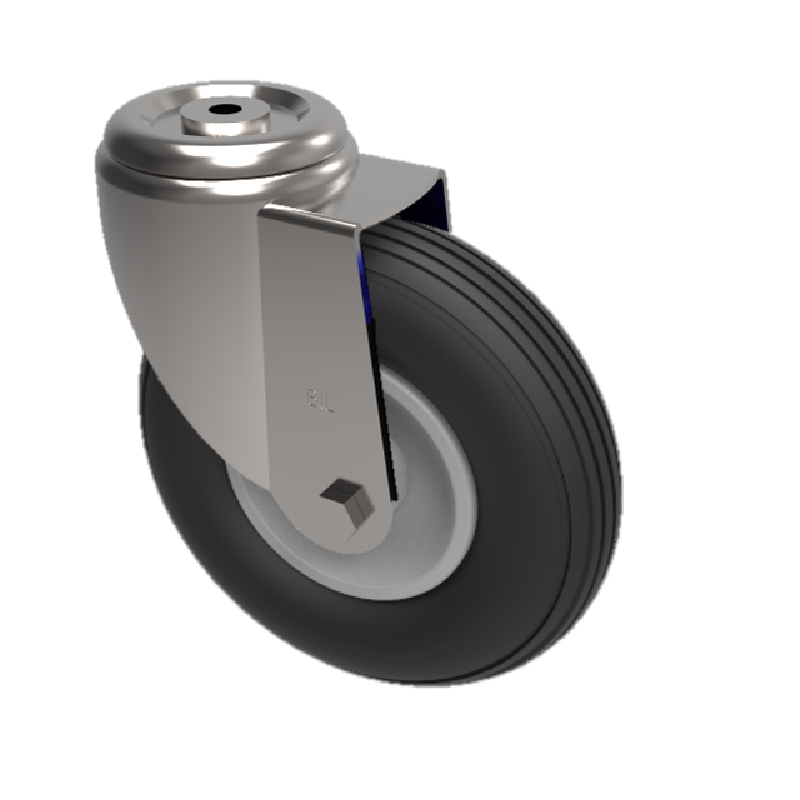 Pressed steel swivel castor with a 12mm bolt hole fitted with a black pneumatic tyred steel centred wheel (2 ply) with a roller bearing and total lock brake.Wheel diameter 200mm, tread width 50mm, overall height 235mm. Load capacity 75kg. 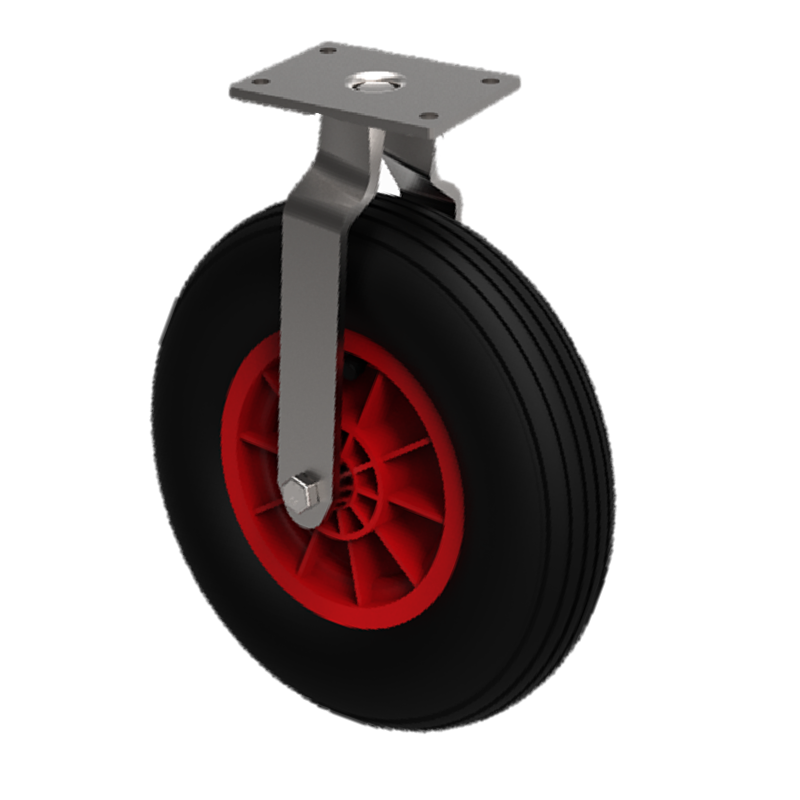 Fabricated fixed castor with a top plate fixing fitted with a black ribbed pattern puncture proof tyre red polypropylene centred wheel with plain bore.Wheel diameter 260, tread width 85mm, overall height 318mm, plate size 115mm x 105mm, hole centres 92mm x 67mm or 76mm x 76mm. Load capacity 120kg. 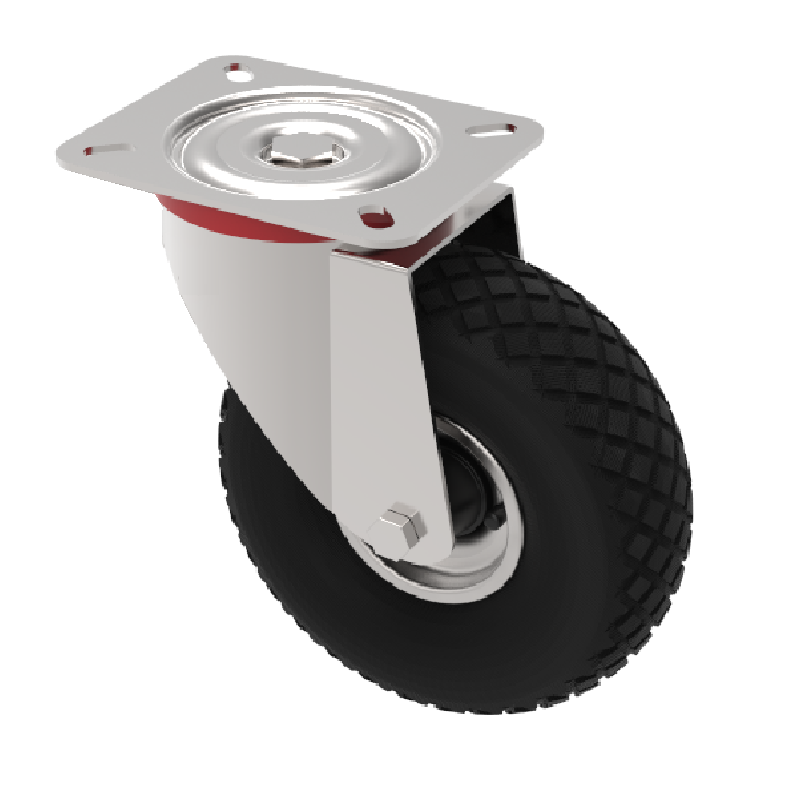 Fabricated fixed castor with a top plate fixing fitted with a black diamond pattern puncture proof tyre red polypropylene centred wheel with plain bore.Wheel diameter 260, tread width 85mm, overall height 318mm, plate size 115mm x 105mm, hole centres 92mm x 67mm or 76mm x 76mm. Load capacity 120kg. Fabricated swivel castor with a top plate fixing fitted with a 4 ply black diamond pattern pneumatic tyre with a grey steel centre and roller bearing. Wheel diameter 260, tread width 85mm, overall height 318mm, plate size 115mm x 105mm, hole centres 92mm x 67 or 76mm x 76mm. Load capacity 200kg. Fabricated swivel castor with a top plate fixing fitted with a 4 ply black ribbed pattern pneumatic tyre with a grey steel centre and roller bearing. Wheel diameter 260, tread width 85mm, overall height 318mm, plate size 115mm x 105mm, hole centres 92mm x 67 or 76mm x 76mm. Load capacity 200kg. 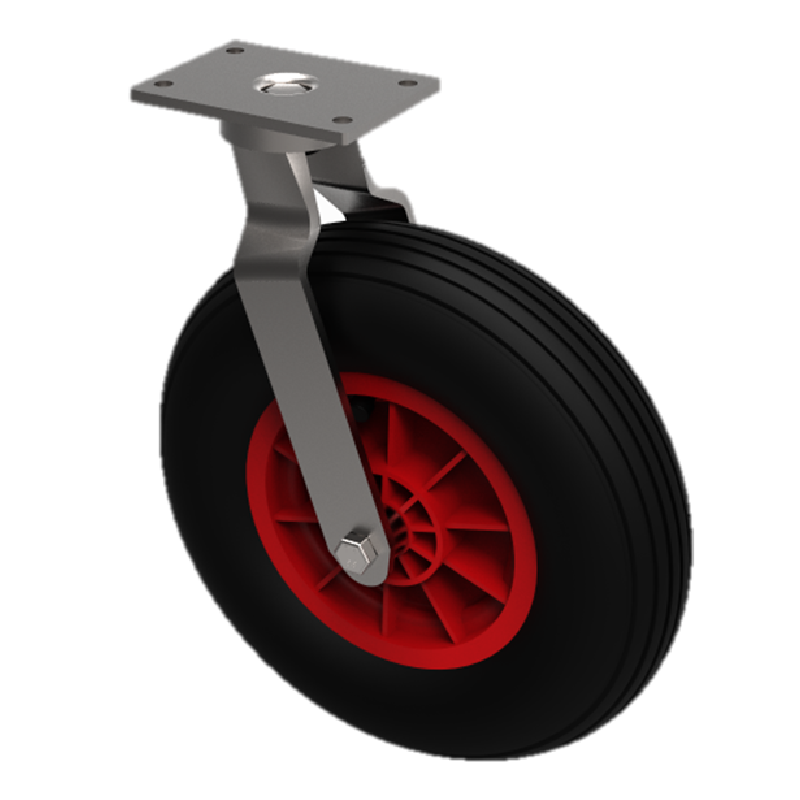 Fabricated swivel castor with a top plate fixing fitted with a black ribbed pattern puncture proof tyre red polypropylene centred wheel with plain bore.Wheel diameter 260, tread width 85mm, overall height 318mm, plate size 115mm x 105mm, hole centres 92mm x 67mm or 76mm x 76mm. Load capacity 120kg.